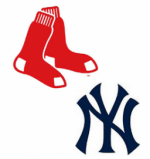 The Boston Red Sox and the New York Yankees meet at Yankee Stadium on Tuesday night. These two squads are no strangers to sitting atop the American League East. They have combined for 17 American League East titles over the last 20 seasons. Neither team has played anywhere close to that level so far this season.What better way to get the two arch-rivals will some momentum? Pit them against each other. TV: 6:35 p.m. ET, MLB Network, NESN (Boston), WPIX (New York); LINE: Yankees -108; O/U: 8.5 -110. Boston combined the majors’ highest-scoring offense with a top-10 pitching staff last year. It led them to their fourth World Series title in 15 seasons. The offense has fallen off, and are tied for 14th with 74 runs scored, in 2019. The pitching is among the worst in the majors with a 5.93 ERA, that ranks 28th in MLB. The offense and the pitching held true to form Monday as the Red Sox were pounded 8-1 by Baltimore in the final contest of a four-game series. The loss left Boston without a series win in five tries. New York has been a tad better. It is a miracle with the team dealing with a host of notable injuries. They enter this series having lost five of six and sporting a 3-6 home record. The last of the Yankees’ recent losses came in New York on Sunday. They could muster only four hits and gave up five stolen bases to the Chicago White Sox in a 5-2 loss. The Red Sox have won four of the last five meetings, including last year’s AL Division series. The Yankees took six of nine at home against Boston during the regular season. Chris Sale has hardly looked like himself so far in 2019 for the Red Sox. Sale is easily off to the worst start to a season in his decorated career. He has given up at least five runs in two of his first three turns in the rotation. The lefty has lasted no more than four innings in those outings. The seven-time All-Star was hammered for five runs on seven hits at home last Tuesday against Toronto. This was after road losses at Seattle and Oakland. Sale boasts a 1.86 ERA in eight career appearances (seven starts) at Yankee Stadium. He has tormented Aaron Judge, who is 3-for-18 with 13 strikeouts against him. Paxton struggled through his worst turn in three tries as a Yankee on Wednesday. He gave up five runs on eight hits. That included two homers, over four innings in a loss to Houston. The only start at home was arguably his best since coming over in a trade from Seattle this offseason. He yielded two runs, only one earned, over 5 2/3 innings in a loss to Baltimore. J.D. Martinez is 4-for-8 against Paxton. He is 2-0 with a 2.49 ERA in four career starts versus the Red Sox.